David Sheffield was born and raised in Buffalo, NY. This city, like many Rust Belt towns, possesses a well-honed sense of pride for its sports teams and historical manufacturing contributions. 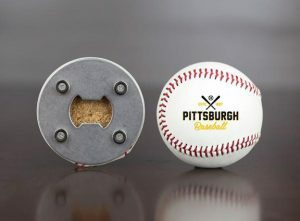 David’s small manufacturing company, Buffalo Bottle Craft, creates simple products that let others around the country show pride for their sport teams, too. 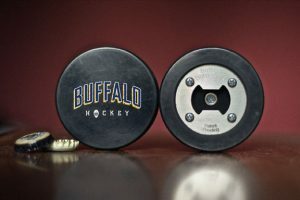 Buffalo Bottle Craft makes bottle openers concealed in hockey pucks, baseballs and golf balls. Sold with a favorite sports team name or customized logo, David sells them to individuals and also has a thriving wholesale business. His 400 sq. ft. shop is located in The Foundry, started by a few of his friends. 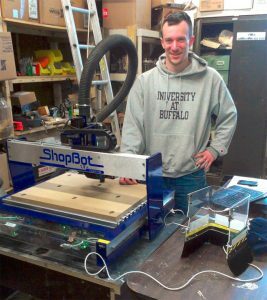 David’s manufacturing process utilizes the ShopBot Desktop model along with a Mimaki UV Digital Printer and a few other tools. 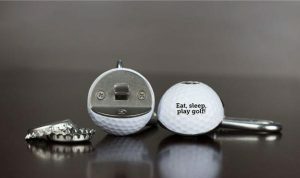 Having already machined around 40,000 hockey pucks and 2000 golf balls in less than 3 years, David’s mastered machining these alternative materials. Trained as a mechanical engineer, David always wanted to start his own business. He gained exposure to many different processes including CNC while working for an engineering company that designs and builds assembly line systems. Making drinking glasses out of wine bottles was a good side business. But since each cup was handmade it wasn’t scalable. David is a huge sports fan, particularly hockey. After seeing a friend make a bottle opener out of round chunk of wood that looked like a hockey puck, he got an idea. Conferring with this friend, who wasn’t interested in making hockey puck bottle openers, he ventured into making them himself. Initially David used a drill press. But again, the process wasn’t scalable. 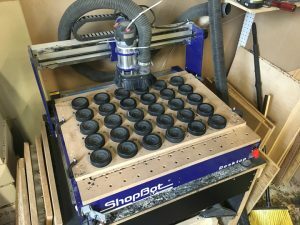 So began his hunt for an automated system, which brought him to ShopBot Tools. Compared to other CNC machines of similar size, the Desktop met his production needs. “I was looking for something I could pull out of the box and start up,” David reflects. “If you are doing small products like I am, having a full size machine doesn’t make sense.” In anticipation of its arrival, David watched a few video tutorials. And when the machine arrived, “I pulled it out of the crate, put it on the table and had it running within 2 hours,” he remembers. And with it running for 8 hours a day, the machine stands up to the challenge. A local company, Dynamic Saw, creates custom bits for him and his custom jigs help to machine 2000-3000 items for inventory. Buffalo Bottle Craft’s website allows customers to use their own designs to customize his products. David can handle up to 3000 customized items in an order. 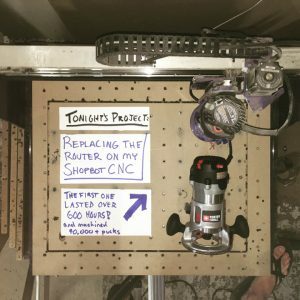 David found this same customized service in ShopBot’s lifetime tech support. “That is what drove me to the original purchase, and the forum and how helpful everyone was there,” David offers. “Just being able to talk with someone over the phone, Frank or any of those guys, or send them a part file to look at” has been invaluable. David originally tried patenting his product but found the process costly ($5000 for initial drawings and paperwork from a lawyer) and not necessarily helpful, and decided not to pursue it further. “The terminology the lawyers use is a defensive thing, not an offensive thing. If someone copies your patent, then you have to go after them. It is your money again,” he experienced. As David sees it, “instead of putting resources towards a patent I am trying to be the first to market, the best product offered, and get the most people to see it. My resources are better spent doing it that way than going after a patent.” He does have a trademark on the name, which cost him $2000 to do. During the past 3 years, David also figured out the marketing side of things. Like many young entrepreneurs, he posted his first product, the hockey puck, on Reddit: It drove sales forward. He’s done this with each subsequent product, only posting 1 or 2 times about them. “Reddit readers don’t like it when you try to sell them something,” David says. His products were featured in various beer publications after he sent them an email and a free sample. David laughs, “I only started doing that actively at the beginning of this year and wish I had done that years earlier. It has really helped generate wholesale traffic.” With 30-35 wholesale accounts at any given time and constant re-orders, David created display cases, too, to hold more multiple items. 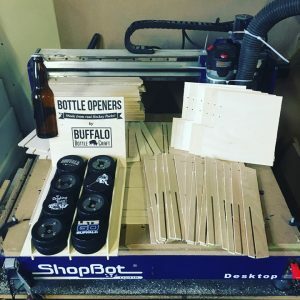 Buffalo Bottle Craft has it’s own website, and the products are also sold through Amazon, Ebay, Etsy’s wholesale branch, in stores and brewpubs. The display cases are made using Baltic Birch plywood. The Beer Wedge. All David’s products are magnetic.